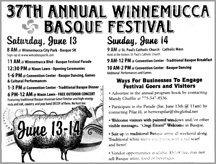 The Winnemucca Basque Club will be hosting its annual festival this weekend, June 13th and 14th at the Winnemucca Convention Center. The festivities will begin on Saturday with the Third Annual Race to the Winnemucca Basque 5k. The race will begin at Bode Memorial Pool Parking Lot at 8am. To register, or for more information, click here. Some of the proceeds of the race will go towards the Josh Rose Scholarship fund. Following the race, there will be a parade at 11am, with opening ceremonies to follow at 12:30pm. 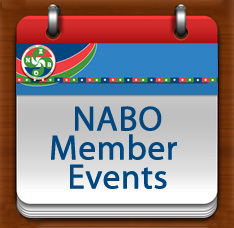 From 1-6pm there will be Basque dancing, games and cultural performances with dinner being served from 1-3pm. The day will conclude with a concert/dance featuring Jean Flesher, and Decoy from Reno who plays rock, country and pop. Sunday will begin with mass at 9am followed by a traditional Basque breakfast, again at the convention center, from 9-12pm, followed by more dancing and games. Festival flyer available here. 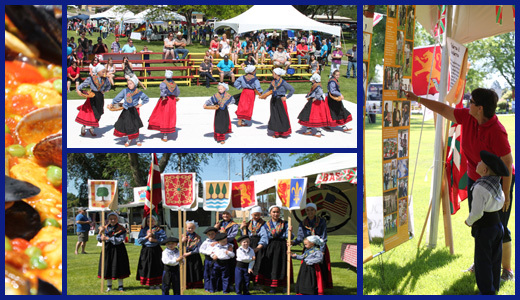 On June 6, Ontario, Oregon Basque Club once again participated in the community festival called America's Global Village. After the parade, the club's Beti Alai Dancers were among several dance groups that entertained the crowd throughout the afternoon. 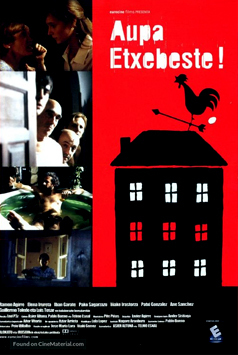 The Basque village menu featured txorizo sandwiches, txorizo and sheep cheese pintxos, paella, and txutxus. 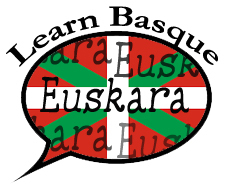 The Basque village featured educational banners to help the community learn about the history, culture, and language of Euskal Herria and the Basques in eastern Oregon as well as the club's Saint Michael Festival that takes place in the fall. There was also a photo booth in which children could pose against a Basque landscape in order to earn their passport stamp. The Basque village was flanked by the Pioneer and Japanese villages. Others villages included Scottish, Irish, Native American, African, Mexican, and German. You can view photos on the club's Facebook page. Bizkaia's Provincial Government, Bizkaiko Foru Aldundia, is sponsoring two events during Jaialdi week to benefit the Cenarrusa Foundation for Basque Culture. The first is a wine education/tasting with Sommelier Mikel Garaizabal at the CWI Culinary Arts at Boise State University. The event starts at 7pm and cost to attend is $42.39. For more information, as well as to purchase tickets, click here. The second, a dinner prepared by three Basque chefs, will take place on Saturday, August 1st from 6:30-11pm at the Boise Arid Club. The dinner will include 6 courses with 6 wine pairings. All reservations need to be prepaid as no tickets will be available at the door. Group tables are also available. For complete menu information or to purchase tickets for this event click here. 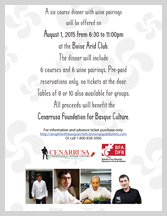 Again, all proceeds from both events will benefit the Cenarrusa Foundation for Basque Culture. On egin!